ARLINGTON, Texas (AP) — Texas Rangers general manager Jon Daniels expects to interview five to eight candidates in his search for the team’s new manager. Daniels wasn’t prepared Tuesday to talk about a list of potential candidates to replace Jeff Banister, who was fired with 10 games left in the season. But the GM talked about some of the potential characteristics he was considering in the search. “Certainly this job is managing people, personalities, egos, really develop relationships to where you can get through on a variety of different levels,” Daniels said, two days after the Rangers finished with 95 losses and last in the AL West for only the second time in 11 seasons. The only additional staff change Daniels announced was that assistant hitting coach Justin Mashore would not be back after three seasons in that role. While some assistant coaches could return, Daniels told the remaining staff, including pitching coach Doug Brocail and hitting coach Anthony Iapoce, that the team isn’t going to commit to anyone for 2019 until a new manager is in place. Daniels said the number of interviews for the manager’s job would probably be in the range of five to eight, similar to four years ago before Banister replaced Ron Washington, and could expand if there is not a good feeling about the candidates. As for whether he preferred someone older or younger, or a manager driven by analytics, Daniels said there was no “cut-and-dry answer” to that. Banister and Washington were both first-time MLB managers. Banister won AL West titles each of his first two seasons, and Washington led the Rangers to their only two World Series appearances before he abruptly resigned for personal reasons late in the 2014 season. Don Wakamatsu, the bench coach who became interim manager, is considered a candidate. He returned to Texas last November after four seasons as the bench coach in Kansas City. He previously served on the Rangers staff from 2003-07 and was a candidate when Daniels hired Washington after the 2006 season. 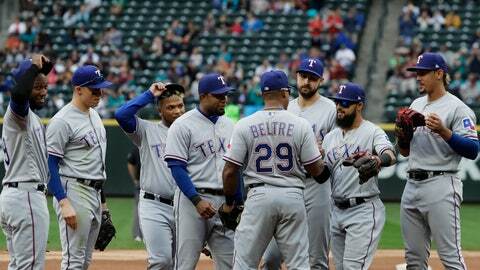 Seven position players 25 or younger played at least 106 games this season for the Rangers. “The development of our young players who have come up through our system was a big bright spot for all of us, both in terms of the opportunity and what they did with it,” Daniels said. The Rangers also go into the offseason not knowing if future Hall of Fame third baseman Adrian Beltre will come back for a 22nd big league season. Beltre, who turns 40 next April, has 3,166 career hits and 477 home runs. Beltre, who is not signed for 2019, has said he will spend some time with his family before taking time to make a decision. Daniels said Beltre’s situation would impact some roster decisions, and that he hasn’t talked to the third baseman about what his role would be if he decides to play another season.